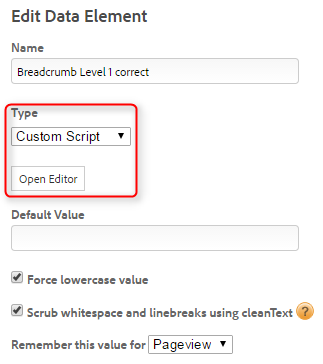 Suppose I needed a Data Element that gives me the first element of my bread crumb list. Unfortunately, that won’t work, as some of you might have encountered. It has to do with the way DTM accesses data in the DOM — it essentially traverses the path and ultimately accesses the last bit of it using array notation. So how do we do it, then? DTM is flexible, right? There must be a way, right? This is probably the shortest and easiest quick tip in the history of this blog. Short and sweet. I hope it is still useful! 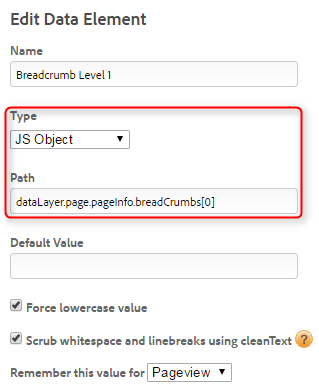 In a similar manner, in the Data Element custom code you could do “return dataLayer.page.pageInfo.breadCrumb” (which returns your array), then call it with “_satellite.getVar(‘Breadcrumb’)”. That way you can easily access any of the array values using just a single Data Element by changing the number in the call. I also use the same method to store objects, then call them with “_satellite.getVar(‘Page Info’)[‘author’] to get values for specific keys. I use this method to store a few arrays and objects I use frequently but which aren’t part of the data layer supplied by the developers; kind of my own DTM supplied data layer. Don’t think that works, though. I’m getting “Uncaught SyntaxError: Unexpected number(…)” in Chrome. Pity, it looked nice and easy. Thanks, Jan – this issue was really starting to frustrate me. Your blog is a great resource. Thanks for the praise, Rik. Glad it helped!